The official email from 26 May rather aroused questions than answering them. Iron Bet is Iron Poker’s sister brand for sport bets. However, the email did not tell that the poker room was shutting down as well. Therefore, we tried to log in at the poker software – but it didn’t work. When trying to set back the password we received an error report. And when raising a question to the support this was left unanswered. This fits in with what other poker players experienced, who reported that they couldn’t log in at 2+2. On 30 May, we finally received an answer from a Playtech representative who reacted to our question: Iron Poker is closed as well. Meanwhile, after a longer time of waiting, players are forwarded to Iron Poker’s sister brand Titan Poker. However, we strongly discourage you to open an account there after the recent incidence. You should rather consider opening an account at the following recommendable poker rooms. What happens to the customers’ money? 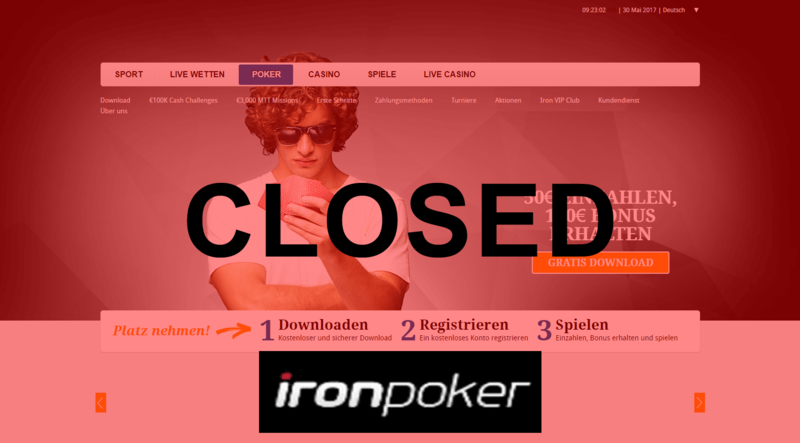 The fact that neither business partners nor customers were informed about the closure in advance doesn’t shed a good light on Iron Poker. In its official email, the poker room didn’t even inform its customers what to do in order to withdraw their balance. When a brand from a brand family (here: Iron Poker, Winner, Titan) closes, its customers are usually migrated to one of the other brands. That means: they can use the product, which only has a different name, and can log in at the new brand with their existing account. The credit is automatically transferred. But not in this case. Even though we explicitly asked about this issue we didn’t get any information concerning a migration. Since players cannot log in with their accounts any longer, they also cannot request a withdrawal without consulting the support. However, in an online forum we read from customers who could request a withdrawal via phone and whose money was disbursed just as requested. That keeps our hopes up. Nevertheless, the fact that the poker room shut down without notice only allows for two possible conclusions: there were problems behind the scenes, like for example technical or financial problems. Or the management is absolutely incapable and/or ruthless. Neither of it is a good sign. Therefore, we strongly discourage you to play at Titan or Winner. If you’re not bound to the iPoker network, we recommend 888poker. Otherwise here’s an overview of the iPoker Apps. One thing’s for sure: these are uneasy times for online poker. With Iron Poker ceasing operations this is the second brand that shut down within one month. After having financial problems, PKR claimed insolvency at the beginning of May, 2017. PKR belonged to the Microgaming network. Iron Poker, however, which became very popular within a rather short period of time, was part of the iPoker network which is run by Playtech. Its popularity was also due to its nice App. Also our editors at poker-apps.net tested the Iron Poker App a couple of times and gave it a good ranking. In the meantime however, we struck Iron Poker off of our high score list.